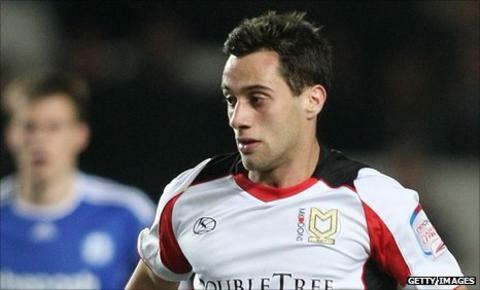 MK Dons have rejected a bid for striker Sam Baldock from an unnamed club. West Ham boss Sam Allardyce has been linked with a move for the 22-year-old after watching him score a hat-trick in Saturday's 6-2 win over Chesterfield. The Dons accepted an approach from Peterborough in the summer, but the deal fell through. "We have had an offer, an official offer. I believe that will be the first of many," MK boss Karl Robinson told the club website. "I don't want to name the club, the club deserves the respect to not be named. "The chairman's been very good, we have a valuation on Sam that we feel the player deserves. "He's been a remarkable servant for the club during his time here - he is one of ours, he's come through the system. "We'll see what unfolds but sometimes the clubs that we're talking about are remarkable football clubs and sometimes it's money that you can't reject. "I'd be disappointed to lose him but we will see what the next 24 hours brings for the club and Sam Baldock." Baldock, who has six goals from as many games this season, said earlier in the week: "I think West Ham are a fantastic club and [Allardyce] is a phenomenal manager but it's not anything I've thought about. "It's not something that's been mentioned to me. It's all rumours as far as I'm concerned.